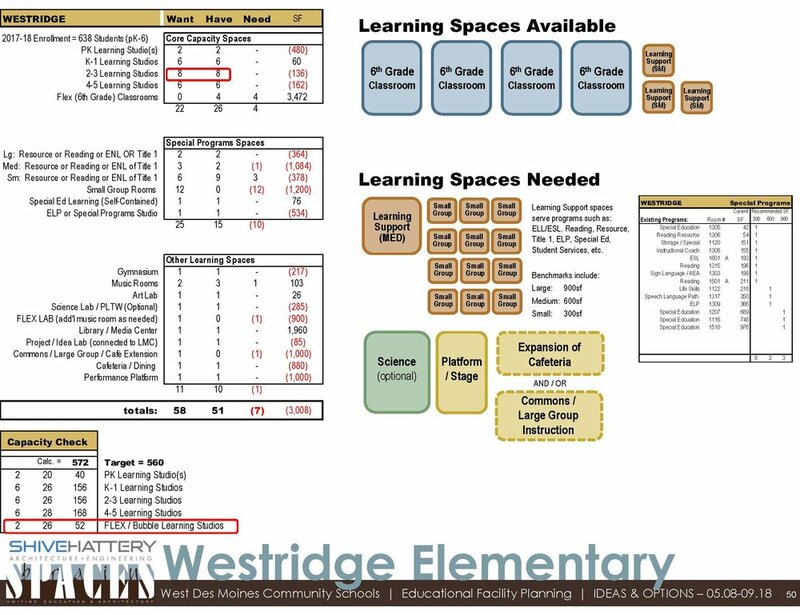 The following information outlines progress to date on the Master Plan for Westridge Elementary. This graphic indicates how each space is currently utilized with sixth-grade in the building. This graphic details the available space within the building once sixth-grade moves to middle school. That space is compared to the space desired based with the addition of a PK classroom and other specific needs at Westridge. Learn more about a fit analysis. This graphic outlines options for reconfiguring current space and creating additions to the building to accommodate current and future needs. This graphic outlines where potential additions to the building could be developed based on available land and current parking configurations.